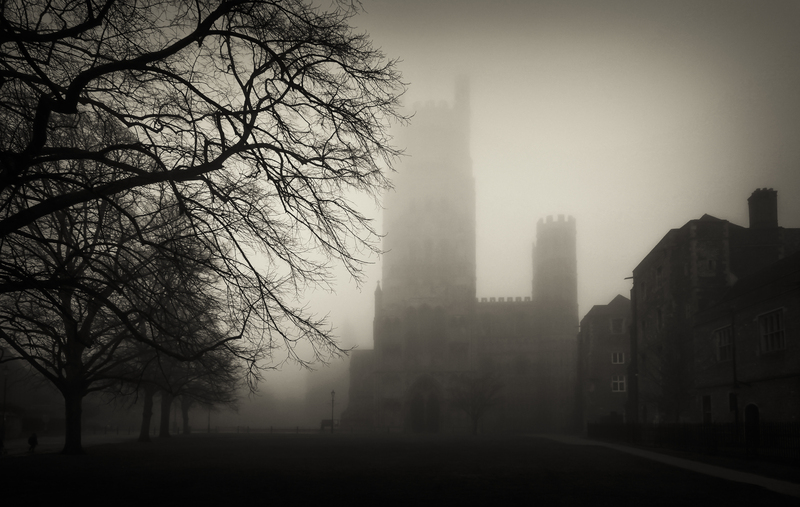 This is an image taken of Ely Cathedral, shrouded in fog on a cold, damp November evening. Editing consists of tonal and colour adjustments. ‘Built by William the Conqueror as a prominent outpost after the bloody and lengthy rebellion by Hereward The Wake, Ely Cathedral stands as a fine example of William’s devotion to his Religion and to his overwhelming victory for the Heart’s and Minds of that mixed of all races called the britons’. ‘Less well known is that “The Lord Protector”, OLIVER CROMWELL closed the Cathedral for 10 years, or thereabouts, due to a falling out with the local (Catholic) Clergy. Cromwell used it as a stable for his Calvary Horses’!